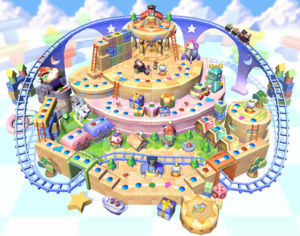 Toy Dream in Mario Party 5 is a board map from the Dream Depot, played in the Party Mode of the game. Toy Dream is also one of boards players must defeat the Koopa Kid trio in, in Story Mode, although the board there is smaller and simpler. It is created from dreams of toys. Built on a light-blue, checkered platform amongst the clouds, Toy Dream is surrounded by a wall of building blocks. It is built out of toys, including a toy train, toy ship, presents, a robot, toy soldiers and other such objects. One of the toys is based on Mecha-Bowser. It shoots any player that stops on the Happening Space in its mouth from a cannon. If players land on a Happening Space on top of a wall of blocks, toy soldiers blast down the blocks, knocking them to a lower section of the board. Landing on the Happening Space on top of a present in the middle of the board causes a Jack-in-the-Box to catapult whoever landed on it to another part of the board. Landing on the Happening Space in front of either train station gave players the opportunity to ride the train one full circuit, collecting coins released from the engine along the way. The "Cabin Fever" song in Dance Dance Revolution: Mario Mix is a rearrangement of the background music, called "Lots of Toys". This page was last edited on October 4, 2018, at 23:15.